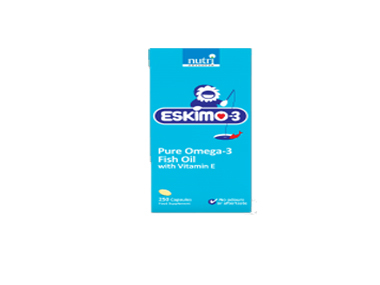 We sell Eskimo3 products like Eskimo 3 Pure Omega 3 Fish Oil with Vitamin E - 105 capsules online in the UK and directly from our award-winning store in Scotland. Omega-3 fatty acids have been well studied, with EPA and DHA contributing to the normal function of the heart, and DHA supporting normal brain function and vision. We sell real Eskimo3 and other Fatty Acids & Omega directly from our shop in Scotland and online throughout the UK. View more products from Eskimo3. Where can you buy real Eskimo 3 Fish Oil 105 caps safely online? If you are wondering where you can buy Eskimo 3 Pure Omega 3 Fish Oil with Vitamin E - 105 capsules safely online in the UK, then shop with us. We are an actual health foods shop; with real people selling real foods and products. Our award-winning independent shop is located in Stirling, Scotland since 1976. You can buy our Fatty Acids & Omega in store or safely place an order with us online or over the phone. Eskimo 3 Fish Oil 105 caps - Eskimo 3 Pure Omega 3 Fish Oil with Vitamin E - 105 capsules in Fatty Acids & Omega and Herbal Remedies, Tinctures & Supplements.